If you feel like you're about to drown in credit card debt, the last thing you need is to get deeper into trouble, but that's exactly what could happen if you fall for a scam that attempts to profit from your financial misfortune. Do some research before hiring a company that promises to help you deal with your credit card companies and get debt relief. The Federal Trade Commission (FTC) suggests entering the company's name in a search engine with the word "complaints" to read what other people have said about the firm you are considering. While there are new federal credit card regulations that protect consumers from unfair credit card industry practices, such as arbitrary interest rate hikes, there is no new government program for getting out of paying off your credit cards. Nobody can just make your credit card debt go away. If it sounds too good to be true, then walk away. This is bad advice, the FTC says. 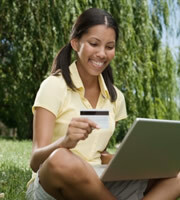 Keeping in touch with your creditors is critical when you are having financial difficulty. Don't fall for empty promises like this one. No one can guarantee a halt to calls from debt collection companies or protection from lawsuits. Settling debt for less than you owe is not what it's cracked up to be. Settled debts, which are reported to credit reporting bureaus, hurt your credit score and make it tougher to qualify for mortgages, car loans, and other credit cards. Beware of companies that require you to pay a full fee in the first few months before they have produced any results. Rather than paying a company to settle your debts for you, consider getting help from a reputable, non-profit credit counseling service. You can get referrals through the National Foundation for Credit Counseling. In addition, the U.S. Department of Justice maintains a list of approved credit counseling services on its website, and the FTC offers consumer tips for choosing a credit counselor. 0 Responses to "Need help to address credit card debt? Avoid companies that display any of these 6 red flags"